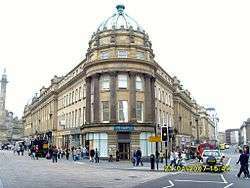 Grainger Town is the historic heart of Newcastle upon Tyne, England. Incorporating classical streets built by Richard Grainger, a builder and developer, between 1824 and 1841, some of Newcastle's finest buildings and streets lie within the Grainger Town area of the city centre including Grainger Market, Theatre Royal, Grey Street, Grainger Street and Clayton Street. These buildings are predominantly four storeys, with vertical dormers, domes, turrets and spikes. Richard Grainger was said to 'have found Newcastle of bricks and timber and left it in stone'. Of Grainger Town's 450 buildings, 244 are listed, of which 29 are grade I and 49 are grade II*. Grainger Town covers approximately 36 ha, and the architecture is dubbed 'Tyneside Classical' architecture. One of the streets of Grainger Town, Grey Street, was described by Nikolaus Pevsner as 'one of the finest streets in England'. The area also includes a mediaeval 13th century Dominican friary, pieces of the historic Town Walls and many fine Georgian and Victorian buildings. Almost all of Grainger Town is within Newcastle's Central Conservation Area, one of the first to be designated in England. The majority of the buildings are in private ownership. The area around Grey's Monument and Grey Street is expanding fast, with high quality shopping outlets, designer fashions and jewellery. The Central Exchange, containing the Edwardian Central Arcade, is located within this area. Grey Street was built by Grainger in the 1830s with the aid of several architects, including John Dobson. The whole of the western side of the street was designed by two architects from Grainger’s office, John Wardle and George Walker. Dean Street, which continues south from Grey Street was constructed earlier, in 1749. Grey Street contains the Theatre Royal designed by John and Benjamin Green, the southern entrance to Monument Metro station and the Central Arcade. It is renowned for its Georgian architecture, and was in 2010 voted 'Best street in the UK' by BBC Radio 4 listeners. The street runs south from Grey's Monument; after the junction with Mosley Street it continues as Dean Street. Like Dean Street, it follows the route of the Lorke or Lort Burn, which formerly flowed into the Tyne but is now underground and so it curves slowly to the east as well as descending towards the river. The street was initially named Upper Dean Street, but it was subsequently renamed as Grey Street. Central Arcade on Grainger Street with Monument on left and Market Street on right. Grainger Market is a Grade I listed covered market, constructed as part of the 19th century redevelopment of the city to replace markets on the site of Grey Street. It was designed by John Dobson and was opened in 1835. It was divided into two parts: the eastern section, which was a meat market laid out in a series of aisles, and the western section, which was a vegetable market constructed as a large open-plan hall. The vegetable market's roof was defective by 1898 and was replaced by the current roof in 1901. The original uses of the market for meat and vegetables have since changed considerably, but there are still a number of butchers' stalls there. The market is home to perhaps the smallest branch of Marks & Spencer, a market stall known as Marks and Spencer's Original Penny Bazaar. In the 1960s and 1970s, parts of Grainger Town, amounting to around a quarter of Grainger's original scheme, were demolished to make way for projects such as Eldon Square Shopping Centre. In the 1980s and early 1990s, the once-prosperous area of the city was overtaken by new centres of retail and commercial activity. In the early 1990s, Richard Grainger's legacy was in poor shape, as shops and offices moved out to other locations. The residential population of the area was falling rapidly to 1,200 and showed no signs of improvement. Around 100,000 m² of floor space were vacant, and the area exhibited all the classic symptoms of urban decay. There were calls for clearance of listed properties and whole streets. Structural problems became evident, with 47% of its 244 listed buildings classed as being 'at risk' and a further 29% classified as vulnerable. The area was now in the realms of a very poor environment and so investor confidence was low. A programme of property development and environmental enhancement was started in 1993 with Newcastle City Council and the English Heritage to tackle most of the worst buildings at risk and stop the decline of the area. In 1996, Newcastle City Council, English Heritage and English Partnerships decided that the area could no longer be left to take care of itself and so EDAW were commissioned to produce a regeneration strategy for Grainger Town and to prepare a bid for government funding. The proposals aimed to turn Grainger Town into a dynamic and competitive location in the heart of the city. The aim of the project was to make Grainger Town a high-quality environment appropriate to a major European regional capital. Arrangements were then put in place to make that a reality. The project was to take place over six years. The project commenced in April 1997, and by its completion in March 2003, over £174 million had been attracted into the area including £146 million from the private sector, exceeding planned £74 million by £100 million. JD Wetherspoons, a U.K. pub chain, spent 13 months restoring the French Renaissance style of the former Union Club opposite Newcastle Central Station. When completed, the pub was renamed The Union Rooms. As a result of the restoration, architectural features, such as a 15 ft high stained glass window and a huge stained glass dome, were added to replace the original features that had fallen beyond repair. The building was built in 1835 by Grainger for the Bank of England. The Grade II listed building was rescued from disuse and decay with the help of a CAP grant in 1997. Following the extensive repair, Bar Luga has established itself on the ground floor, and fully let offices are on the remaining four floors. Land Securities developed a new 19,235 m² retail and leisure complex, which opened in 2002. The Gate is a covered multi-level centre, with a glass façade, housing a twelve screen multiplex cinema, a sky bar with views over the city, a variety of restaurants and a casino. 1506 jobs created as well as a further 800 in Grainger Town from the increased confidence in the area. 286 new businesses set up. 80,900 m² of new and/or improved commercial floorspace. 121 buildings, many of them listed properties and classified as 'buildings at risk', restored for use. 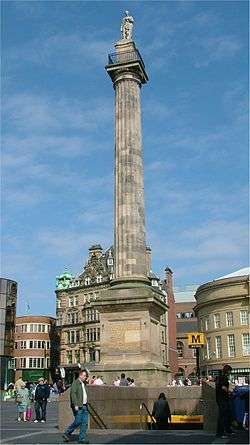 Grey's Monument repaired and cleaned. 289 flats and apartments completed with many located within the Grainger Street and Clayton Street areas. Westgate House, which was an eleven storey office block, perhaps Newcastle’s most unpopular building, was acquired by ONE North East and demolished between late 2006 and early 2007. ↑ "Around Tyne. Grey Street". BBC. 2007-12-13. Retrieved 2008-07-09. Grey Street in Newcastle was voted the best street in Britain by Radio 4 listeners. ↑ "GOOD CASE STUDY - GREY STREET, NEWCASTLE UPON TYNE". BBC radio 4. Retrieved 2008-07-09. Said by many to be amongst the greatest streets in 'England if not Europe', this gently curving and rising street has been 'sensitively restored and improved in the last decade'.